Great colours – more choice than every before. Over 20 standard colour combinations plus funky new colour ways: luscious limes, perky pinks, terracotta, cool translucents. Great lead time – 28 days from artwork approval. Great quality – EC manufacture to our exacting QC standards. 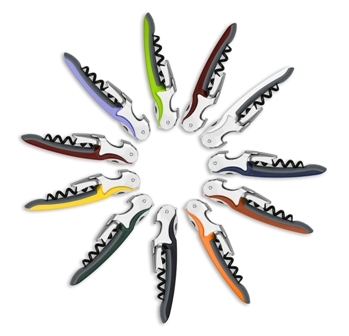 Murano Corkscrew model 70. A great new cork puller at budget beating prices, exclusively from Waiter’s Friend® – Masters in the Art of Wine Accessories.